I was asked to provide global administrator username and password with impersonation rights while performing backup. What is it? How do I perform Office 365 exchange mailbox backup? What are the system requirements to perform Office 365 exchange mailbox backup? 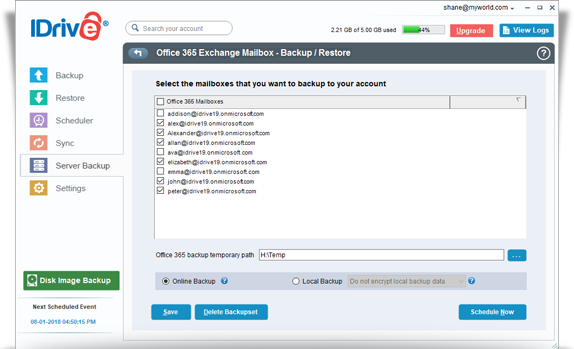 Does IDrive support incremental backup of Office 365 exchange mailbox? How do I perform Office 365 exchange mailbox restore? 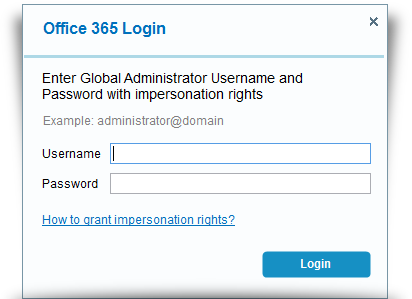 How do I assign impersonation rights for global administrator? What do I have to do to assign impersonation rights from Windows Powershell? I want to assign impersonation rights from Office 365 Exchange Admin. How do I do that? How can I assign discovery management rights to global administrator? 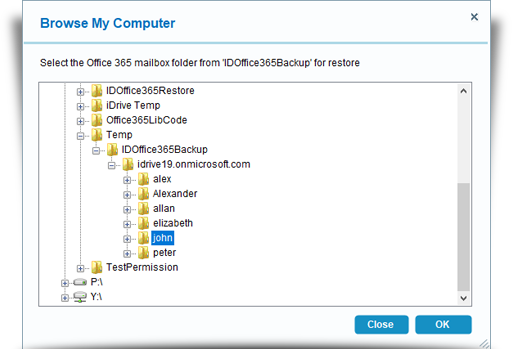 Does IDrive support backup of Office 365 mailbox Journal folder? Can I restore the backed up recurring tasks from my IDrive account? To perform Office 365 exchange mailbox backup, you need to have appropriate impersonation rights. Click here to know more on impersonation rights. Under 'Office 365' section, click 'Backup'. Enter global administrator credentials with impersonation rights. View steps to grant impersonation rights. Select the mailbox(es) that you wish to backup from the list displayed. Specify the temporary local backup path and click 'Schedule Now'. Note: Ensure that the selected temporary location on your computer has sufficient free space to hold the contents of the individual mailboxes. You cannot select a temporary location on the remote location. 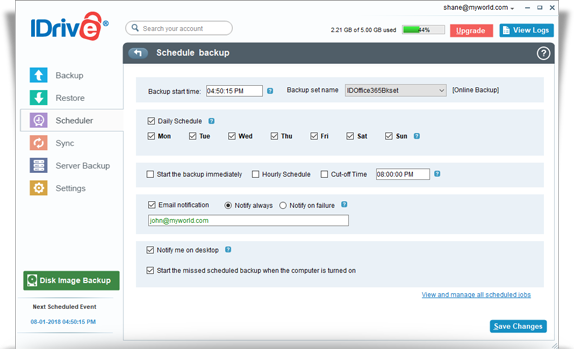 The 'Schedule backup' screen appears, from where you can schedule the backup for any future day and time or perform an immediate backup of the selected mailboxes. Yes, IDrive supports incremental backup of Office 365 exchange mailbox. Under 'Office 365' section, click 'Restore'. Enter global administrator credentials with impersonation rights. View steps to grant impersonation rights. Select mailbox from the list displayed and browse the backed up mailbox from 'IDOffice365backup' folder. 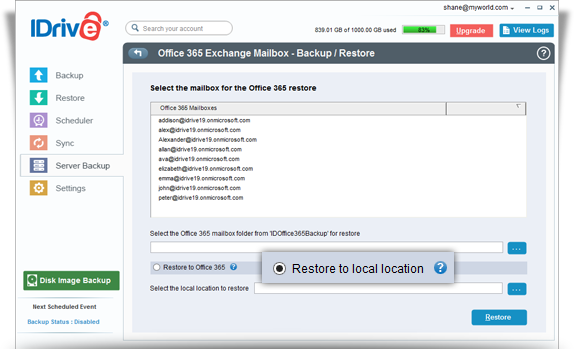 Click 'Restore' to restore your backup data to online exchange mailbox. You can also restore the backed data locally. Select 'Restore to local location', browse the path to restore locally and click 'Restore'. Data will be restored in eml, vcf, ics format with folder structure intact. You can assign impersonation rights from Windows Powershell as well as Office 365 Exchange Admin. Open Powershell in Administrator privilege mode. 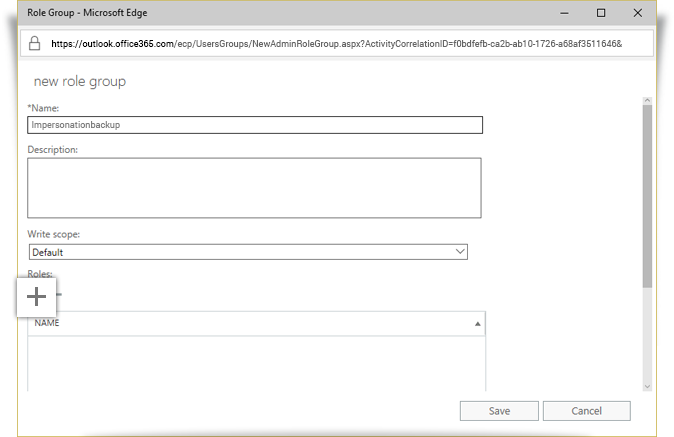 Note: Assign global administrator login credentials to a variable, so that the credentials can be included in the connection command. For Example: C:\Windows\system32> New-ManagementRoleAssignment –Name:backupimpersonation –Role:ApplicationImpersonation –User: admin@domain.com"
Add-RoleGroupMember -Identity "Discovery Management" -Member "Shane@domain.com"
PS C:\Windows\system32> New-ManagementRoleAssignment –Name:backupimpersonation –Role:ApplicationImpersonation –User: "admin@domain.com"
PS C:\Windows\system32>Add-RoleGroupMember -Identity "Discovery Management" -Member "Shane@domain.com"
Note: You must connect to the Office 365 exchange server before granting impersonation rights. 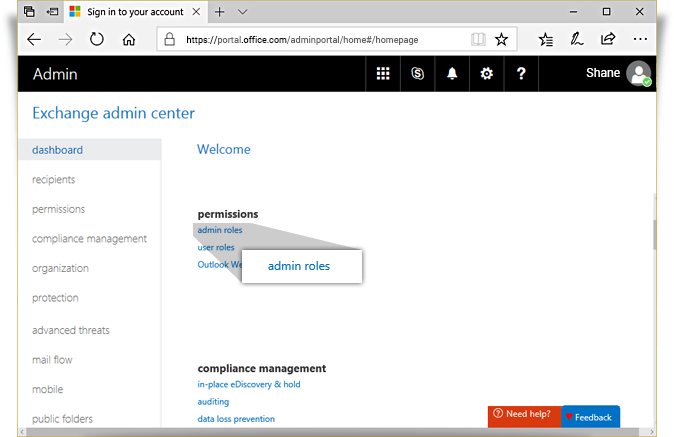 Login to https://portal.office.com as an Admin. Click and go to 'Admin'. On the left navigation bar, click 'Admin centers'. Click 'Exchange'. In the 'Exchange admin center' page, click 'Admin Roles' under 'Permissions'. Click to add a new role. In the 'new role group' window, enter the name as 'Impersonationbackup'. Under 'Roles' click to add a role. Select 'ApplicationImpersonation', click 'add' and click 'OK'. Under 'Members', click to add a new member to the role group. Select your admin account, click 'add', and then click 'OK'. In addition to impersonation rights, we recommend you to assign discovery management rights to global administrator too. In the list, select 'Discovery Management' and then click . 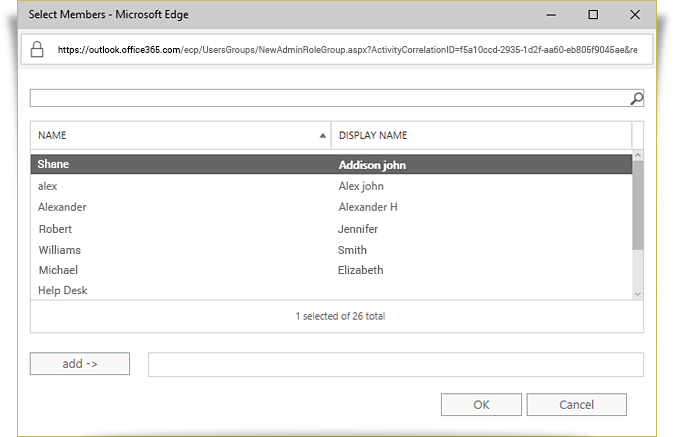 In 'Role Group' window, click under 'Members'. Select the users, click 'add', and then click 'OK'. No, IDrive does not support backup of Office 365 mailbox Journal folder. No, you cannot restore any recurring tasks from your IDrive account.